The largest city in all of Oregon and one of the biggest port cities in the United States, Portland is also the 26th most populous city in the nation. The city is well known all around the world for its progressive values and welcoming culture, as well as its impressive skyline and rich history. 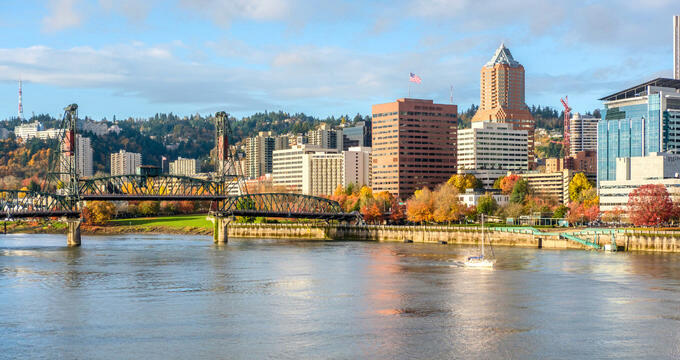 Portland covers an area of 145 square miles and has an estimated population of around 650,000 people, with almost 2.5 million living in the surrounding Portland metropolitan area. Sitting in the Willamette Valley at the point where the Willamette and Columbia Rivers meet, Portland was actually named after the city of Portland in Maine, which was named after an Isle in England. The town was originally just a little settlement in the 1830s along the Oregon Trail but quickly developed into a key location for the entire country, with its location proving perfect for the transportation of goods. In the 1900s, Portland was actually regarded as a very dangerous city, but that reputation faded over the years and the city became better known for its progressive social values and eco-friendly nature. Nowadays, Portland is classed as one of the most environmentally-friendly major cities, not just in the United States but in the entire world, and attracts many visitors each year, boasting countless attractions and reasons to visit, from museums and galleries to recreational activities, top class cuisine, and live entertainment. The elevation of a city is a key geographical statistic that tells us how high it is in relation to sea level. Many major cities around the United States are located in coastal locations with low elevations, and Portland is no different. Portland, Oregon has an elevation of just 50 feet (15 m). This is quite similar to other major port cities around the nation like New York City, which has an elevation of only 33 feet (10 m) and New Orleans, which actually has an elevation between 1 foot (0.3 m) and 2 feet (0.6 m) below sea level. Portland’s elevation is much lower than the state average. Oregon is actually the ninth highest state in America in terms of its mean elevation, which is 3,300 feet (1010 m). This is because some parts of the state are quite mountainous, but Portland is located right on the coast and therefore has a much lower elevation. The highest point in the city of Portland is located at 9936 NW Wind Ridge Drive, which has an elevation of 1,188 feet (362 m), while the city's lowest point is part of the Columbia River that has an elevation very close to sea level of just 0.6 feet (0.19 m). The highest point in the whole state of Oregon is Mount Hood, which is found in the Cascade Volcanic Arc in the northern part of the state and has an elevation of 11,249 feet (3429 m), while the lowest point of the state is the Pacific Ocean, which is naturally at sea level. Other major cities in Oregon include Bend, which has an elevation of 3,623 feet (1,104.3 m), and the state capital of Salem, which has a relatively low elevation of 154 feet (47 m). In both comparisons, the elevation of Portland, Oregon, is lower than these cities. The city of Portland, Oregon enjoys a temperate climate with relatively warm average temperatures for the Pacific Northwest. The city is known as the 'City of Roses' due to the fact that its climate is actually just right for growing these beautiful flowers. Portland tends to have quite warm and dry summers with average highs of 81°F (27°C) through the hottest months of July and August, with cool and rainy winters. A small amount of snow can be expected to fall in Portland during the coldest times of the year. There are a lot of things to do in Portland, with an activity or attraction to suit almost every single visitor. This is one of the largest cities in the United States, boasting dozens of restaurants, museums, clubs, theaters, galleries, and more. The town also has popular sporting venues, thousands of acres of parks and green spaces, a planetarium, a zoo, and more. The city is particularly well-known as a prime cycling destination, holding races and events each year, as well as organizing the Portland Marathon and other great sporting events each and every year for people who want to stay fit and active.